The GIS Research and Map Collection on the second floor of Bracken Library constantly receives new materials throughout the year. Researchers, students, and scholars use maps to study a variety of subjects from geography to biology and even literature. 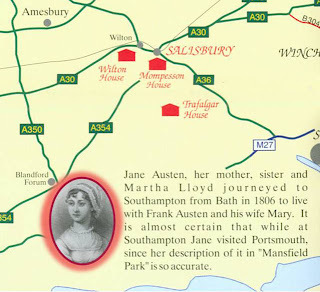 One of the newest maps in the Map Collection is Jane Austen’s England: A Literary Tour Guide. The map covers an area in England southward from Manchester to Portsmouth and eastward from Plymouth to Dover. Landmarks and historical houses included in the works of Jane Austen are featured. Illustrations of houses used for television and film productions of Austen’s novels are also displayed on the map. This map of homes and haunts of the author is similar to other maps in the Map Collection related to the works of Shakespeare, Sinclair Lewis, and the works of J.R.R. Tolkien. The Map Collection also includes maps of fictional places such as Narnia. The GRMC English and Literature Cartographic Resources in Ball State University Libraries subject guide provides a complete listing of the literary maps available in the Libraries. The subject guide is available on the GRMC Web page at http://www.bsu.edu/library/article/0,,59405--,00.html. Maps from the GRMC circulate for two weeks or longer. For more information about this map or to request digital copies of maps, please contact the staff of the GRMC at 765/285-1097.